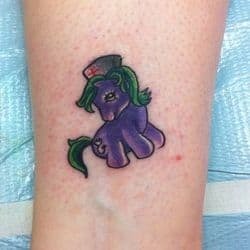 Imperial Tattoo in Sugar Land, Texas has become a surprising well-spring of anti-bullying activism after the attempted suicide of Michael Morone, an 11-year-old student and "brony" (a male fan of "My Little Pony") from North Carolina. The tattoo parlor's owner, Tony Wayne, took action immediately, offering $20 "My Little Pony" tattoos in order to raise funds for Michael and an anti-bullying organization. It turns out that Michael and tattoo aficionados have more in common than one might initially think. "We've done 25-30 of them since last week and more are booked this week," said store owner Tony Wayne. "They're regular guys, tattooed mean lookin' guys." Wayne says as soon as he saw Michael Morones' story, he knew he had to help. "Tattoos are about freedom of expression. Michael should have been free to like My Little Pony if he wanted to," Wayne said. "I knew other kids would be being bullied and this was the only way I could think to help." Patrons with personal stakes in Michael's story have also gone to Imperial to receive their equine ink. Christy Van Kannon, 34, from Katy got a blue My Little Pony with a red mohawk on the inside of her left arm. She said she felt compelled to do it because one of her 12 year old daughter's school friends also committed suicide because of bullying. "I have three kids," said Van Kannon, "For me this was an incredible opportunity to show people how important it is to stop bullying, We have to stand up for others that cant stand up for themselves"
Michael's recovery is suspect at this point, and he is still in critical condition at a North Carolina hospital. He may have severe brain damage. A recovery fund has raised nearly $70,000, but some of the Imperial's donations will also go to Stomp Out Bullying, a bullying prevention organization aimed at kids and teenagers. "I didn't even realize this was going on, but things should not be gender specific. I'm getting (a My Little Pony Tattoo) myself now. You don't have to be a girl to like My Little Pony," Wayne said.